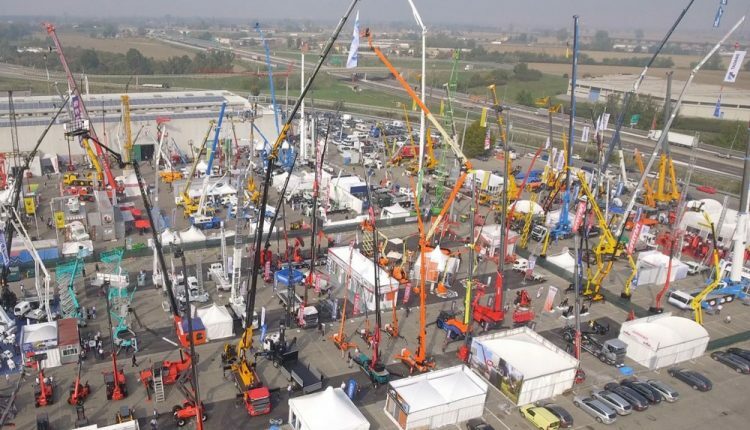 The 6th edition of the Italian lifting show GIS taking place in Piacenza (Italy) from 5 to 7 October 2017 finished a few days ago achieving a terrific success in terms of direct exhibitors (308) on an area of over 30.000 square meters (see impressive overview pictures of the outside area and the 2 Halls of the Piacenza exhibition center). Being GIS an audited exhibition, the precise number of the visitors who crowded the showground during the 3 opening days of the fair is on the way to be announced, but we can anticipate you that the expected figure of 10.000 qualified visitors has been achieved, confirming the operators’ interest for the GIS format which – at the moment – is the unique European event dedicated to the lifting, industrial & port handling and specialized transport vehicles. Further, it was noted a substantial increase of the number of direct non-Italian exhibitors (22), but also of visitors, a fact which will make the next edition of GIS – foreseen from 3 to 5 October 2019 – even more international. This has also been confirmed by the official patronage, given for the first time to GIS 2017, by important international associations such as ESTA, the leading European Association for the abnormal road transport and mobile crane rental industry and PROJECT CARGO NETWORK. bus also by the Italian Army and the Italian Navy and by the 50 Italian main trade associations, whose members are regular users of machinery and equipment displayed at the show. During GIS 2017 lots of conferences and workshops were held, some of which organized by Italian associations of equipment manufacturers, but also users. From the institutional point of view, the conference organized by Angelo Scorza of Ship2Shore on the theme of ports, terminals and logistics which saw the intervention of Ivano Russo, Director of the Cabinet, Italian Ministry of Infrastructure and Transport. Highly appreciated was also the speech of Sen. Riccardo Nencini (Vice Minister for Infrastructure and Transport) during the A.I.T.E. and A.N.N.A. conferences, where he announced the program of the new ANAS five-year plan, with funding of EUR 29 billion and a half (of which EUR 27 billion and a half already financed) intended to provide the roads and bridges maintenance. Last but not least, was the conference on the theme of “lifting and specialized transport for the oil & gas and power generation” whose speakers were CEOs and Managing Directors of companies like DNV, ENERPAC, FAGIOLI, MAMMOET, RINA and TECON. Of great interest was also the presentation of Mr Ton Klijn, ESTA Director, of the new European Crane Operator Licence (ECOL) project. Given the tremendous success of the event, the next edition of GIS – which will take place from 3 to 5 October 2019 – will reserve some important novelties, starting with more and larger exhibiting spaces and a bigger international presence. In 2019, an extension of the outdoor and indoor spaces is planned, with the addition of Pavilion 3, which will host the first edition of the AGV Expo dedicated to Automated Guided Vehicles, a highly expanding compartment that deserves an ad hoc space and will bring GIS a lot of visitors from a variety of fields: automotive, mechanical engineering, ceramic, food, beverages, pharmaceuticals, plastics & rubber, paper industry, clothing, wood and paint industries. A unique initiative, even at European level, destined to be of further strong international appeal for GIS 2019.